LE ULTERIORI CONTROVERSIE OLOCAUSTICHE DI ROBERTO MUEHLENKAMP Parte II. 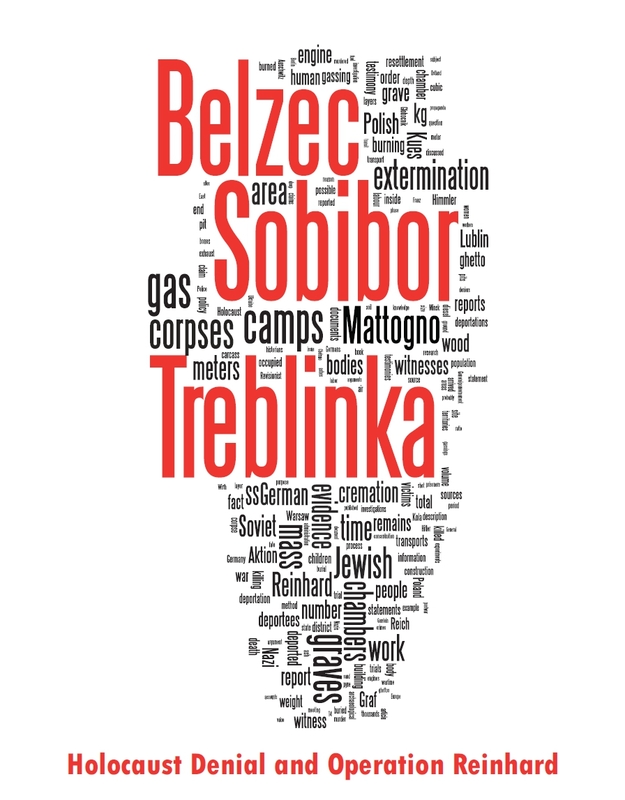 In Part 2 of my original article I had commented Mattogno’s comparisons in his Belzec book between Prof. Andrzej Kola’s mapping of the Belzec mass graves and earlier maps of these graves (one drawn by J. Bau according to information from eyewitness Rudolf Reder, the other two drawn by the investigative commission of the German crimes in Poland and published in an article by commission member Eugeniusz Szrojt), namely Mattogno’s conclusion that "the location given by Kola for the majority of the graves is in disagreement both with Rudolf Reder’s testimony and with the findings of the Polish investigative commission". I had also commented Mattogno’s remarks that the mass graves were "scattered at random all over the camp, without any particular orientation or order" (and thus supposedly at odds with "the proverbial German pedantry") and that some of them had "the oddest shapes", along with his quip that "if the camp commander had had the mass graves dug in such an irregular fashion, he would have been shot for sabotage". a) In what concerns the map drawn by J. Bau, the information provided by Rudolf Reder as concerns the location of the graves may have been misunderstood by J. Bau. 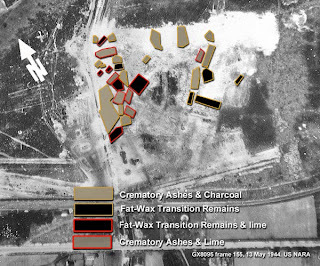 b) The area of the graves shown in the investigative commission’s maps corresponds to the graves Prof. Kola located in the eastern part of the camp. c) The mass graves as identified by Prof. Kola are not as randomly scattered as Mattogno claims, but concentrated in the western and north-western part of the camp area on the one hand and in the eastern part of the camp area on the other. 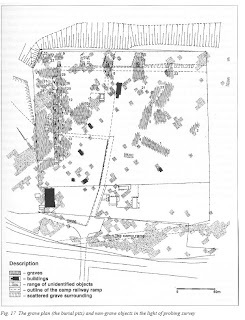 d) Placing the graves as close together as depicted in J. Bau’s map could have increased the risk of grave walls collapsing and made removal of the soil taken out of the graves more difficult. e) Most of the graves are not shaped in an "odd" manner but have the form of squares or rectangles, and the irregular shapes of some of the graves may be attributed to subsequent changes of the grave structure. f) Mattogno’s "sabotage" quip reveals an ignorant notion of practices within the SS hierarchy, where no one is known to have been shot for showing incompetence in carrying out mass murder. Regarding a), he pointed out that that the drawing was expressly stated to be based on the account of Rudolf Reder, and quoted two rather exaggerated statements of Reder's about the number, size and capacity of the mass graves, accusing me of dishonesty for not having addressed the exaggeration of Reder's claims as concerns the mass graves' size. Regarding b), he accused me of being "deceptive" on grounds that "while in Kola’s plan the majority of the graves are located along the north-west border, in the plan of the Polish investigative committee they are all concentrated in a rectangular area on the north-east border of the camp". To c), he replied that "the mass graves are scattered higgledy-piggledy in the shape of a horseshoe, in the north-west/north-east parts of the camp, as is irrefutably shown by Kola’s plan". Argument d) he did not address. Argument e) he claimed to be a confirmation of his "thesis" whereby "only a part of the mass graves discovered by Kola can be considered original, that is, dug by the camp authorities for the interring of corpses", referring to section 4.6 of his response for further discussion of this issue. In response to argument f), he made a big fuss about his having been "ironic" in connection with his claim that "only a part" of the mass graves identified by Kola can be considered original, and about my having failed to spot his fine "irony". a) The J.Bau drawing’s being expressly stated to be based on the account of Rudolf Reder does not rule out a misunderstanding as concerns the depiction of the mass graves’ location, and the same applies to Reder’s exaggerated claims about number, size and capacity of the mass graves quoted by Mattogno (which contain no information about the location of the mass graves). Moreover, J. Bau’s drawing is not as far removed from Prof. Kola’s plan as Mattogno would like it to be. b) Mattogno’s objection, which I had written nothing to the contrary of, is irrelevant as it only means that Polish investigators in 1945 had wrongly assumed that there were graves in the north-eastern area only. c) I noted that "scattered at random all over the camp, without any particular orientation or order" had become "scattered at random, in the form of a horse-shoe, in the north-western and north-eastern parts of the camp", the two concepts not being identical and concentration of graves in two specific camp areas meaning a certain "orientation or order". d) I pointed out Mattogno’s having ignored my previous argument, and mentioned the additional possibility, supported by the research of Alex Bay, that the camp’s SS-staff had only gradually acquired the expertise and technical means enabling them to provide for an orderly arrangement of the mass graves. e) I pointed out that the mass graves that Mattogno considers oddly shaped are only 6 out of the 33 mass graves identified by Prof. Kola. (Mattogno’s further arguments in this context are discussed in section 4.6 of my rejoinder). f) "Ironic" or not, Mattogno’s "sabotage" quip showed him to be an intellectual dwarf, as one of my fellow bloggers had aptly called him. The latter remark must have hit a raw nerve and be the reason (or one of the reasons) for Mattogno’s hysterically rabid tone in his response blog LE ULTERIORI CONTROVERSIE OLOCAUSTICHE DI ROBERTO MUEHLENKAMP Parte II. Much of this blog consists of Mattogno’s restating his previous claims amid furious foot-stomping and further laughable accusations of "dishonesty". This applies especially as concerns item a), where Mattogno spends about two pages hollering about the exaggerations and other well-known inaccuracies in Reder’s testimony. Eager to retaliate for my having pointed out his omitting one of my "duller" ("più insulse") arguments, bitching fish-wife Mattogno even brings Gerstein into the fray and claims that I gave "further proof" of my "dishonesty" by "omitting" the sermon in his book about the overblown figures of Reder and Gerstein and avoiding the question of how to justify the "lies" proferred by "my" ("suoi") two eye-witnesses. My having written in the rejoinder that Reder’s statements about the number, size and capacity of the mass graves are "rather exaggerated as concerns the second and consequently the third of these aspects" then makes poor Charlie freak out completely: he bangs on the table and yells that the witness’s overblown estimate of 3 million victims of Belzec extermination camp (which exceeds the actual death toll by a factor of about 7) is not an exaggeration but a "spudorata menzogna", a "shameless lie". As the "Revisionist" coryphée’s rant continues, Reder’s obviously inaccurate description of the gassing process, which Mattogno considers "devastating for Holocaust historiography" (he should pay attention to Dr. Neander’s explanation of how historiography works) could also not be missing. My response to this hysterical outbreak of Mattogno’s is simple: as I already pointed out before, my original article was about the mass graves found at Belzec by Prof. Kola’s archaeological team and Mattogno’s considerations about whether these archaeological finds are compatible with the mass murder of hundreds of thousands of people at that camp. The subject matter of Part 2 of that article was (besides the above-mentioned claims regarding the arrangement and shapes of the mass graves) Mattogno’s contention that the maps of J.Bau/Reder and Szrojt essentially contradicted Prof. Kola’s findings as to the location of the Belzec mass graves. Reder’s and Gerstein’s exaggerations and other inaccuracies are immaterial to this subject matter and therefore need not be addressed in its context, period. They certainly don’t rule out the possibility – which must always be considered regarding information from a second-hand source and is therefore a relevant argument, notwithstanding Mattogno’s protestations that it is no argument at all – that map-drawer J. Bau misunderstood Rudolf Reder’s information as concerns the location of the mass graves, a possibility that can only be ruled out by demonstrating that the mistake was contained in Reder’s first-hand account. Such demonstration Mattogno has not provided, for the statements of Reder’s that he insistently quotes contain information about the number of the mass graves, their size and the number of persons that the witness claimed to have been buried in each grave, but not about where in the camp the graves were located and there being mass graves in two areas of the camp. Unless there’s anything in this respect in Reder’s account that Mattogno has not quoted, we do not know what information of Reder’s J. Bau derived his depiction of the mass graves’ location from. Mattogno’s arguing that I should have considered eyewitness "lies" about mass grave sizes and numbers of victims in discussing mass grave location differences between J.Bau’s drawing and Prof. Kola’s archaeological map is, as I already wrote in my rejoinder, a dishonest attempt of Mattogno’s to change the subject. Eyewitness accounts usually contain mistakes about certain details and sometimes contain embellishments and downright lies, but the eyewitness testimony that is a lie or a fantasy from start to finish is about as rare as the eyewitness testimony that is accurate in every single detail. Certain types of information, such as figures and orders of magnitude, sounds and the duration of events, are more likely to be affected by an eyewitness’s observation or recollection mistakes than others. Where an eyewitness is found to have lied about a certain detail, e.g. deliberately exaggerated a figure, other parts of that eyewitness’s testimony should be treated with particular caution and considered reliable only insofar as they are corroborated by other evidence independent of that eyewitness’s testimony. Dismissing an eyewitness’s account as wholly unreliable on grounds of mistakes or even untruths contained therein, notwithstanding independent corroboration of other information in the account, is like throwing out the baby with the bath-water. In support of my position I refer to a handbook for trial judges and attorneys written by two German jurists, Attorney-at-Law Professor Rolf Bender, retired Presiding Judge at the Court of Assizes, and Armin Nack, Judge at the German Federal Supreme Court, which has nothing to do with Nazi crimes or with history in general. The above applies independently of whether the exaggerations in Gerstein’s and Reder’s accounts that Mattogno decries as "shameless lies" were or not deliberate exaggerations. The witnesses may have used exaggeration as a means to properly illustrate the horror of what they had witnessed, like medieval chroniclers are known to have done. However, it is also possible that the trauma of their experience magnified the events they had witnessed in their minds, at least in what concerns Reder. I wouldn’t exclude the possibility that Reder genuinely believed in his grossly exaggerated 3 million figure, as I would not exclude the possibility that survivors of the Dresden bombing on 13/14 February 1945 genuinely believe(d) that this bombing claimed hundreds of thousands of victims, even though the evidence exhaustively examined by a commission of historians points to "only" about 25,000 dead. A factor that should also not be discounted as concerns exaggerations, on the other hand, is what Matthew White calls "a very human tendency to exaggerate". All the above means that the fuss made by Mattogno and other "Revisionists" about exaggerations and other inaccuracies in eyewitness testimonies, in order to discredit these testimonies and the evidence of the events they deny in general, is a pitiable exercise in futility. However, the likes of Mattogno are obviously too enamored with their spectacle to understand let alone accept the arguments that show it to be irrelevant. I’ll skip Mattogno’s deplorable attempt (all the more so as it contains another silly accusation of "dishonesty") to save the day for his changing the subject by referring to something he wrote much later in his risposta (i.e. not in response to Part 2 of my original article), and move on to what he objects to my observations regarding the similarities between J.Bau’s drawing and Prof. Kola’s map as concerns the number and location of the mass graves. "A grave was 100 m long and 25 m wide. A single grave contained about 100,000 persons. In November 1942 there were 30 graves, i.e. 3 million corpses." • Most of the graves in J.Bau’s drawing are in the camp’s "north-north-west" sector ("NNO" = "nord-nord-ovest"), where Prof. Kola’s map shows only seven graves. I’d say that the bulk of graves are in the west-northwest, northwest and north-northwest parts of the camp, 5 graves (numbers 11, 8, 7, 21 and 22) are in the north-north-east, north-east and east-northeast parts and 7 (numbers 23, 6, 5, 3, 4 and 1) are in the east, east-southeast and southeast of the camp. One can divide the grave areas into these three zones, or one can divide them into just two zones, one between north and west-north-west (containing 21 out of 33 graves) and one between the north and the southeast (containing the remaining 12), the latter corresponding to Prof. Kola’s subdivision referred to in my rejoinder. Taking as reference point the upper tip of the "side track" (which might also be the track of the narrow gauge train that took the corpses from the gas chamber to the mass graves during the initial phase of the camp’s operation, one can say that the bulk of the graves run from the south-west to the north-west of the camp and the remaining graves are in the north and north-east. Taking as reference point the "guard house with telephone" in the lower part of the "main yard", the directions are west to north-northwest for the larger and north-northeast for the smaller group of graves. Mattogno wrote in his book that the drawing shows "26 graves along the north-western border and 6 in the center" (which incidentally adds up to 32 – just one less than the number of graves identified by Prof. Kola). The graves are furthermore aligned on either side of a complex of buildings including the gas chamber building. 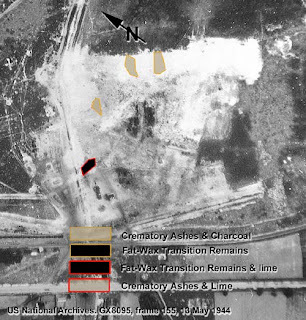 As we shall see below, the gas chamber building during the camp’s second phase was probably located at the upper end of the copse transversed by a rectangular clearing that can be seen surrounded by graves on Alex Bay’s Figure 4.6.1. This means that J. Bau’s drawing, despite its simplicity (just like Yithzak Arad’s map that Mattogno makes a fuss about, it is obviously not drawn to scale and meant to be nothing more than a very rudimentary depiction of the camp to give the reader a rough idea of locations) is remarkably accurate as concerns the approximate orientation of the mass graves, the placing of most graves roughly in the western-northwestern parts of the camp and the location of the graves in relation to the second phase’s gas chamber building. 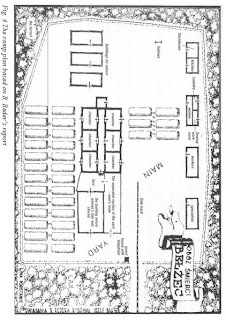 If Reder was the source of this drawing, one can therefore say that, whatever he got wrong in other respects, this aspect (the location of their mass graves and their distribution across the camp’s areas) he got more or less right. 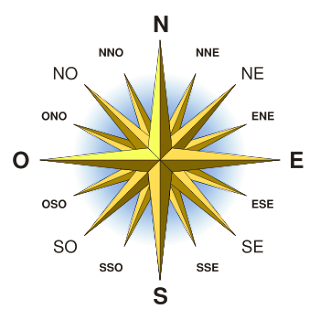 After claiming (regarding item c) above) that his expression "scattered at random, in the form of a horse-shoe, in the north-western and north-eastern parts of the camp" merely complements and precises his earlier expression "scattered at random all over the camp, without any particular orientation or order" (I’ll let our readers decide if that is the case), Mattogno turns to my arguments regarding item d), the arrangement and shape of the graves. To my argument that the "disorderly" arrangement visible on Prof. Kola’s map also had advantages, Mattogno replies with calculations meant to demonstrate that the camp’s organizers could have done better, i.e. combined an orderly arrangement with sufficient space between graves to prevent the collapsing of grave walls, difficulties in removing the soil extracted from the graves being ruled out by the fact that the graves were made one after the other. He proposes an arrangement of 33 graves 17 meters long and 10 meters wide in two rows, one with 17 and the other with 16 graves, with spaces of 6.5 meters ("more than enough to avoid a collapsing of grave walls") between graves and a space of 10 meters between rows. The total area of graves would have been 17 x 10 x 33 = 5,610 square meters, and the area of the entire grave complex, including spaces between graves, space between rows and a distance of 10 meters between each row and the camp’s enclosure, would have been 18,240 square meters ("less than 30 % of the camp’s entire area", as Mattogno points out). In an arrangement as depicted in J. Bau’s map, row 1 (17 graves) plus the space between rows would have measured 280.5 x (17+10) = 7,573.5 square meters and row 2 (16 graves) would have measured 264 x 17 = 4,488 square meters, i.e. the total area of graves and spaces in between would have been 12,061.5 square meters, according to my calculations. The space occupied by the graves actually identified was estimated by Prof. Kola as 0.52 ha = 5,200 square meters, including the smaller pits that I assumed to have been used only for burying cremation remains. What space was covered in total by the graves and the spaces in between them Mattogno did not try to calculate, but this information is essential to determine whether his proposed arrangement would have led to an economy of area dedicated to burial – one of the reasons given by Mattogno for endeavoring to arrange the graves in an "orderly" fashion, the other being "better hygienic protection of the camp personnel". Unless this promised a significant saving of space in comparison with a "disorderly" concentration of graves in certain parts of the camp to accommodate Mattogno’s "hygienic" concerns, why should it have been among the camp staff’s priorities that the graves "all have the same shapes, dimensions, orientation" and be "properly arranged in two parallel rows" as shown on J. Bau’s map? 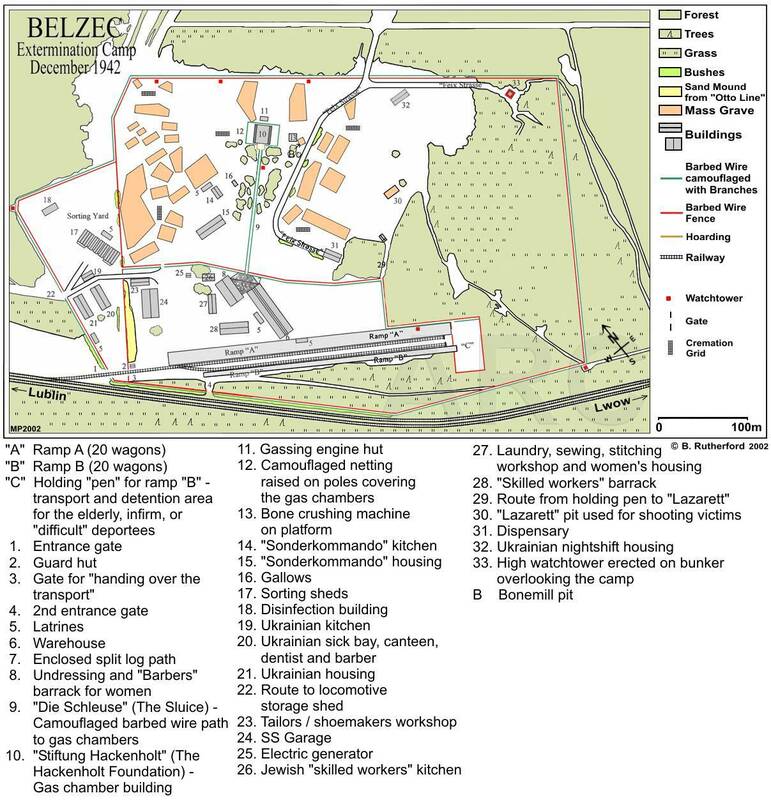 And this is assuming that Belzec extermination camp was originally conceived as it looked like in the end (which is not the case: the camp underwent expansion and significant improvements in infrastructure throughout its operation, as shown in the maps of W. Rutherford) and that the SS-men who ran Belzec got there with the required skills and experience. Mass grave site dimensions are usually given as though they were perfect cubes. In actuality, very large grave sites, like those a Treblinka are more like inverted, truncated pyramids. The deeper the grave, the more it had to be sloped so as to avoid the sides from slumping. This was not likely a safety concern - after all the work Jews who had to fill them or to clamber down inside to arrange the bodies were disposable. The SS would have been concerned that such slumping would make for premature filling and boundary irregularities. At Treblinka the soil was very sandy. This fact made for ease of excavation but troublesome stability. Therefore, one can be certain that the sides of each pit was sloped. It is doubted that there were soil engineering studies done, so the slope angle must have been a guess on the part of the excavator operators, bolstered by empirical experience as they dug along. Viernik cites a depth of ten meters for the pits. If it is accurate, there is even more reason to believe that the sides had to be sloped. How much they were sloped is a pure guess. Soil engineering textbooks have formulas one can plug into to determine the optimum angle, but they require that the soil mechanics be known and can be used as inputs to the equations. 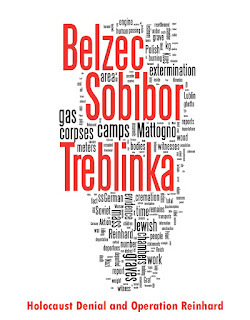 Therefore, we have guessed that at Treblinka, if the pits were dug 10 meters deep, the slope angles were 60 degrees. A pit 50 X 25 X 10 meters would look like that in Figure 8.23. Doesn’t look that easy to me, which is why making such graves – moreover in an "orderly" alignement – is not something I would have entrusted to a manual laborer armed with a measurement tape roll and a thread clew, at least without being around to supervise the fellow and give him instructions. What is more, understanding the need and the advantages of such "orderly" alignment (assuming these were as substantial as Mattogno claims them to be, see above) might be expected of the commandant of a military encampment, who would also bring along the required notions of military organization and discipline, but not necessarily of someone who had worked in the Aktion T4 murder program, like most of those who later supervised the killing process at Belzec (a connection that Mattogno interestingly prefers not to speak about). In section 2 of his risposta, Mattogno had rhetorically asked "what kind of extermination camp commandant would have arranged the mass graves in this fashion". The simple answer to this unfortunate question is: the kind of extermination camp commandant who was doing this for the first time (it’s not like there had been a standard practice in organizing and running extermination camps – after all Chelmno and Belzec were the first such places in human history) and accordingly learning from trial and error, and who considered other things more important than aligning mass graves the way Mattogno thinks they should have been aligned. Who is being ridiculous here? It is immediately apparent that there are six roughly equally spaced sites of disturbed soil or where ashes were present 25 to 30 meters apart ( A through D plus the two grave sites) along this northern camp boundary. All are in the same size range - about 25 meters long - the exception being site D whose full size being unknown since Kola coring ceased in that place. However, the region in which bright new soils brought up by excavation extends another 25 to 30 meters further east. The even spacing and uniform sizes suggests that each site of disturbed soil is a grave, and that the lettered sites were those emptied of bodies for burning and whose the ashes were reburied elsewhere. The ordered arrangement of these sites also points to their belonging to the last period of the camp. 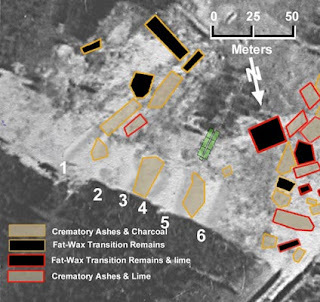 […] If one takes the chaotic and disorderly scatter of the burial sites elsewhere to be symptomatic of the earlier months of the camp's existence, then here, the relatively even spacing and sizes of the graves suggest they belong to the final months. One would expect that the SS’s refinement of the mechanical and procedural techniques of mass murder and corpse disposal to be reflected in more orderly graves. Mattogno calls Bay’s assumption that "more orderly graves" reflect better mechanical and procedural techniques a "simple vicious circle" ("semplice circolo vizioso"), which I guess is supposed to mean a circular argument. Where the circularity is supposed to be he doesn’t explain, and I don’t think he can because there is none (a trial and error approach leads to better procedures in the end, nothing "circular" about that). He asks why Prof. Kola didn’t identify the six graves pointed out by Bay, without considering as likely explanations a) the relatively wide intervals between drills in Prof. Kola’s investigation and b) that these graves were emptied and the cremated remains of their occupants buried elsewhere, whereas Prof. Kola assumed the presence of mass graves only where he found corpses or cremation remains but not where he merely found disturbed soil, as he did in areas near the numbered graves sites in Bay’s Figure 4.6.14. Mattogno then resorts to the quip that one can only see the mass graves pointed out by Bay if one has "la grazia di una fede olocaustica cieca", i.e. "the grace of a blind holocaustic faith", which is all the sillier as it is rather obvious who is arguing on a faith basis here, and adds that in said area Prof. Kola found only three graves with different forms and dimensions. Say what? If there is a partial overlapping of graves identified by Prof. Kola with grave-like disturbed soil sites pointed out by Bay, as seems to be visible in Figure 4.6.14 (between numbers "3" and "4" and between numbers "5" and "6"), this could just mean that the graves in the respective area were less than 6, that some of them were bigger than the shapes identified by Bay or the graves outlined by Prof. Kola, and that after removing the bodies from such graves only a part of the grave space was refilled with cremation remains. Prof. Kola’s pit between Bay’s grave shapes numbers "1" and "2" might be a part of either or a pit into which crematory ashes and charcoal from either or both were dumped. Prof. Kola’s finds on site do not invalidate Alex Bay’s observations, and vice versa. Mattogno further tries to discredit Bay by attacking two other parts of Bay’s study. In doing so he provides a good example of arguing on both sides of his mouth, for in the first case his argument is a disagreement between Bay’s and Prof. Kola’s conclusions, while in the second Bay is taken to task for accepting Prof. Kola’s thesis. The engine itself was not in a separate room, rather, it stood freely on a podium. It was run with diesel fuel. So there’s a good chance that Mattogno missed his target here. One supposes that if the SS thoroughly razed the building, including footings, nothing should remain except disturbed soil horizons.The fact that Kola’s excavations revealed a small area with traces of rotted wood, and no masonry remains implies that the gas chamber was less substantial in material construction. However, countering the indications that led Kola to doubt that Reder was correct about a masonry gas chamber is Kola’s inventory of nearby gave pits in which he listed four graves excavated that contained brick rubble, and three of the four were within 50 to 60 meters of the chamber site (see Figure 4.6.3). This is an indication that when the building was torn down, part of it at least was made of brick which was dumped close by. It is possible that the method of construction was responsible for the absence of masonry. A case can be made for the building’s being erected on ephemeral foundations of wood - a system of piers and grade beams - to support brick walls which subsequently are easily pulled down and disposed of. Appendix A contains a description of this construction method. Aside from the material composition of the gas chamber, the available aerial photography strongly supports the reported dimensions. For example in Figure 4.6.4, the small copse of woods has an opening cut through it 10 meters wide. The second gas chamber was built just beyond the trees, at the end of this cut. The photography shows distinct traces of fencing in the form of dark lineations (see A, B, D), which are believed to be the traces of fencing. The lines would have been the result of the fall of needles and twigs from the evergreen branches woven into the wire as a screening device. Lines A-B measure to be about 5 meters apart. These are undoubtedly the remains of the tube which funneled the victims to the door of the gas chamber. At Treblinka, this feature was 5 meters wide. Alex Bay’s case for a gas chamber building located behind a clearing cut into a copse and made of brick resting on wooden foundations, the brick rubble of which ended up in nearby graves, is well enough supported to at least be worth further discussion. That Mattogno simply ignores it, out of either sloppiness or dishonesty, speaks volumes about his qualities as a "scholar" and is further evidence (if that were still needed) that Mattogno is projecting himself when he calls this writer a charlatan and Bay "another charlatan like him" ("un altro ciarlatano come lui"). This insult is amusingly preceded by Mattogno’s hypocritically arguing that Bay’s pointing out mass graves not identified by Prof. Kola is tantamount to calling the archaeologist "inept and incapable" ("inetto e incapace"). Not only does Bay nowhere state or insinuate this, but the archaeologist’s having missed some emptied graves can be attributed to the above-mentioned reasons including the methodology adopted due to restrictions mentioned by Prof. Kola himself, rather than to incompetence. Besides, if one or the other mistake in an archaeologist’s or other researcher’s conclusions renders that archaeologist or other researcher "inept and incapable", what can one say of the coryphée of "Revisionism" in light of the many blunders that have been pointed out by my fellow bloggers and me?. That must have hit a raw nerve indeed. Mattogno, Belzec, pages 75 f.
 Original Italian version; English translation; quotes after the latter. Belzec Mass Graves and Archaeology: My Response to Carlo Mattogno (2). Belzec Mass Graves and Archaeology: My Response to Carlo Mattogno (4,4). Response to Carlo Mattogno by Joachim Neander, PhD; see also sections 4,1 and 5,1 of my rejoinder. See rejoinder Part 2 and section 5,1. Sections 4,1 and 5,1 of my rejoinder; see also section 4(1) of my original article and my blogs Historiography as seen by an ignorant charlatan … and "Can you give the name of just one Jew, with proof, who was gassed? ", among others. Rolf Bender/Armin Nack, Tatsachenfeststellung vor Gericht - Band I: Glaubwürdigkeits- und Beweislehre, available at Amazon. Excerpts are quoted in the reference thread Guidelines for assessing eyewitness testimonies of the Holocaust Controversies forum. Christopher R. Browning, Evidence for the Implementation of the Final Solution; quotes are from sections 5.4.1 and 5.4.5. For instance when writing about the "Black Death", see S. Fischer-Fabian, Der jüngste Tag. Die deutschen im späten Mittelalter, Knaur editors Munich, 1985, page 26, my translation: "How many victims the plague claimed cannot be determined exactly. Medieval chroniclers reported according to the principle that only exaggeration can illustrate. Horror guided their plume and made the number of victims in some cities exceed the number of inhabitants." Frederick Taylor, How Many Died in the Bombing of Dresden? ; a detailed discussion of numbers that have been on the table over the past decades can be found in Chapter 12 of Götz Bergander, Dresden im Luftkrieg, 1994 Böhlau Verlag GmbH & Cie., Cologne. Historical Atlas of the Twentieth Century > Wars, Massacres and Atrocities of the Twentieth Century: "Let's face it. Big numbers are impressive, and there's a very real human tendency to exaggerate." In the English translation the passage, corresponding to the last paragraph of section 4.6 on page 54 of the original Italian version reads as follows: "To conclude, the number, shapes and dimensions of the mass graves allegedly identified by Kola are completely arbitrary, and their positions irrational and in contradiction with the testimony of former inmates (Reder) as well as accused perpetrators (Jührs), with Polish examinations (the Central Commission for the Investigation of German Crimes in Poland) and historiography (Arad).". I have addressed this claim and it’s supporting arguments in section 4.6 of my rejoinder. Mattogno, Belzec, page 75 and Document 6 on page 119. Mattogno, Belzec, pages 75 f., Mattogno mockingly remarks that "an examination of the map of Belzec as published by Arad forces one to conclude that the quarters of the Ukrainian guards, the hygienic installations (barbers, infirmary, dentists for the SS and the Ukrainians), the kitchen for the Ukrainian guards, the garage, and the shoemakers’ and tailors’ workshops (shown on the map as numbers 3, 4, 5, 7 and 8) were located right next to mass graves or even on top of them!". Silly though it is to make such remarks about a very rough un-scaled sketch that obviously makes no claim to geographical accuracy, Mattogno is so fond of this nonsense that he repeats it in the piece here under discussion. See section 4,1 of my rejoinder. Available on the ARC page Belzec maps: Belzec Extermination Camp May 1942 and Belzec Extermination Camp December 1942. 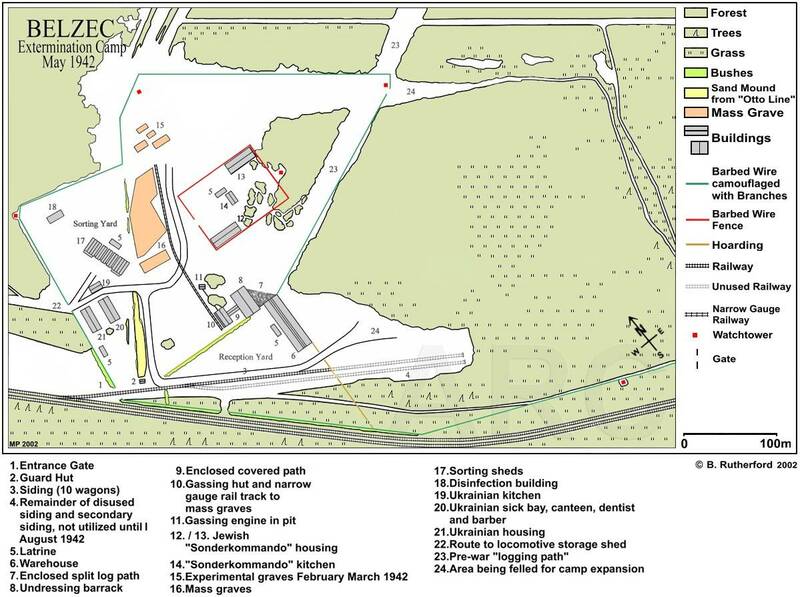 Alex Bay, The Reconstruction of Treblinka - Appendix D - Ash Disposal and Burial Pits (Continued). See biographies on the ARC page Belzec Perpetrators. An overview of the German and Austrian SS and Police Staff. Kola, Belzec, page 13: "Because of the vast area of former camp in Belzec, which required examining, the basic drills were located only in the knots of 5 m net, realising relatively little accuracy in defining the borderline shapes of the located objects (mass grave and non-grave objects". In a related footnote the author explains that: "The acceptation for such a module of drills resulted from both general purpose of the expedition, concerning the establishing places free from mass graves at the camp area and time limit of the works defined and financed by the ROPWiM [Rada Ochrony Pamieci Walk i Meczenstwa – Council of Protection of Memory of Combat and Martyrdom, RM] to commemorate the camp." Interrogation of W. Pfannenstiel on November 9, 1959, ZStL, Z 252/59 vol. I, p. 138, quoted in Mattogno, Belzec, page 59. In all probability a mistaken observation, as insider evidence suggests the use of a gasoline engine. See Sergey Romanov, Why the "diesel issue" is irrelevant. Mattogno’s calculation assuming 5x4 meters for each gas chamber and a corridor between chambers 1 meter wide. Regarding the likeliness of eyewitness mistakes as concerns measurements, see quotes from Bender/Nack’s legal handbook (note 72). 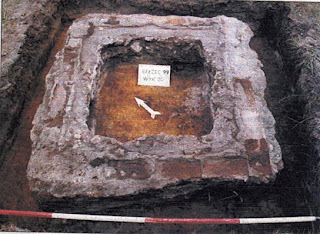 However, it is also possible that the gas chamber building was wider than Prof. Kola concluded from his excavations. Mattogno is one of our favorite regular "customers". "It is no exaggeration to claim that, if the camp commander had had the mass graves dug in such an irregular fashion, he would have been shot for sabotage. Unless, of course, he had peculiar artistic inclinations. Many graves shown by Kola have, in fact, the oddest shapes!" (Mattogno, Belzec page 76). See part 1 of this commentary.